A technique used in mammography and other medical applications to distinguish details from a similarly composed background has been used to decipher scrolls of a classical library destroyed by the eruption of Mount Vesuvius in 79 A.D. 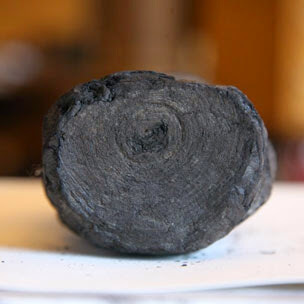 The scrolls were excavated from Herculaneum (sometimes called "the other Pompeii") In the 18th c. and attempts to unroll them were abandoned because of the destruction it caused. "X-ray phase-contrast tomography" has now been shown to work when even infrared cameras and CT scans have failed. A team led by physicist Vito Mocella from the National Research Council's Institute for Microelectronics and Microsystems in Naples, Italy, has identified a handful of Greek letters within a rolled-up scroll for the first time and explains that the technique (VIDEO HERE) works because the carbon-based ink never penetrated the now carbonized papyrus: "So the letters are there in relief, because the ink is still on the top."